Last fall’s IBM Watson class project, ROSS – an app using IBM’s artificially intelligent Watson computer to do legal research – has now received further support from Dentons, the world’s largest law firm. ROSS Intelligence was founded by Jimoh Ovbiagele (computer science), Pargles Wenz Dall'Oglio (exchange student in computer science), Akash Venkat (iSchool) and Andrew Arruda (University of Saskatchewan law graduate). The IBM Watson course was part of a University competition sponsored by IBM and structured as two half-year fourth-year courses (technical and business). The courses were taught in the fall of 2014 by Associate Professor, Teaching Stream Steve Engels and instructors Helen Kontozopoulos and Mario Grech, directors of the Department of Computer Science Innovation Lab (DCSIL). ROSS Intelligence is the first publicly disclosed startup signed to join the law firm’s NextLaw Labs, a project aimed at developing new technology for the legal business and based in Palo Alto, CA. 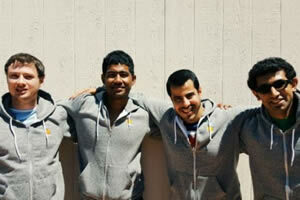 ROSS also recenlty joined Y Combinator, a U.S. seed fund for startups. Photo top left – ROSS Intelligence: Pargles Wenz Dall'Oglio (computer science), Jimoh Ovbiagele (computer science), Andrew Arruda (University of Saskatchewan law graduate) and Akash Venkat (iSchool).